The differentiating feature of the MyColourCups allows a cup to be identifiable by up to six different users. The user of the cup can change the cup’s names in an instant. This feature benefits the user by giving control over an everyday product that directly enhances their lifestyle and indirectly saves environmental resources. Referred to as “dynamic personalisation”. 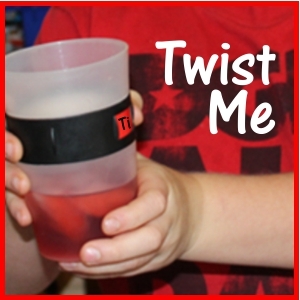 TRICK TO TURN BAND: Grab and turn cup from bottom while lightly holding the black band. The differentiating feature of the MyColourCups allows a cup to be identifiable by multiple users is new and different, and sets the MyColourCup apart from other cups on the market. The user of the cup can change the cup’s names in an instant. This feature benefits the user by giving control over an everyday product that directly enhances their lifestyle and indirectly saves environmental resources. Referred to as “dynamic personalisation”. Follow the steps below to personalize your set. You can also purchase replacement labels that are personalized with your name.